Your home theater should be a place in your house where you can enjoy watching movies and listening to music. It can be as simple as having a 32-inch television hooked up to surround sound speakers or as big as creating a mini movie theater in your home, depending on the budget you are working with. Once you have made your decision regarding the room you will use for your home theater, the next step is to determine if you want a television in the room or a projector. Projectors provide the most movie-like experience, but they are not for everybody. The size of the room you are using for your home theater will determine the size of the television or projector because you have to make sure you have enough space for the rest of the equipment. There is nothing worse than having a big television and projector without the accompanying audio. A home theater needs an audio device that has a radio tuner, a preamplifier that can switch between audio and video sources and a subwoofer output. A subwoofer reproduces extremely low frequencies in movies and music, allowing you to catch things you might not have otherwise caught using regular speakers. The size of your room should help you determine the type of subwoofer to buy. 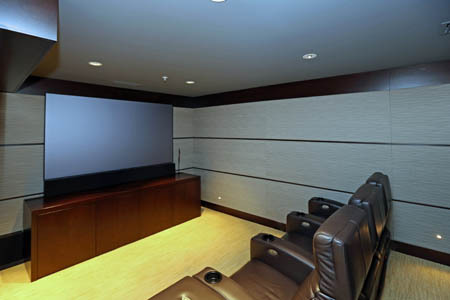 You cannot have a home theater without a remote to control all of your equipment. Instead of having five or six different controllers for each of your electronics, you should have a universal remote to control them all. Having a home theater allows you to enjoy the movie experience from the comfort of your home. It also requires some work on your part to set everything up. If you are thinking of creating a home theater in your home, this list should help you get started.